I want to start off by saying that this is NOT an anti-Mormon podcast and blog, it is a pro-Christian podcast and blog and I want to make sure that people know the difference between true Christianity and those organizations who are masquerading as Christian, such as the LDS/Mormon Church. As far as people goes, anyone would be hard pressed to find a more decent, honest hardworking and kind group of people than those who align themselves with The Church of Jesus Christ of Latter Day Saints, however, being nice doesn't save a person and claiming to be Christian while blindly following a faith that bares as much resemblance to the gospel of Jesus Christ as some of these movies resemble the book that inspired it. We have all seen movies that the only thing they have in common with the book that inspired them is the name and a vaguely similar story, often changing the main plot, the characters and other key elements; it might have the same name but it is not the same story. The Bible is one of the books that inspired Joseph Smith to start the LDS Church, but he altered key elements of the book, including the characters, and made the strong claim that the BIble was corrupted from its original form and that is why it doesn't agree with his doctrine. The LDS/Mormon Church simply is not Christian. I don't want to offend anyone and I have nothing against anyone in the LDS Church, but I want to make it clear to everyone who reads this or hears it that the Church is simply not Christian. Through the course of this episode I will briefly give the history of the origins of the Church and the doctrines it espouses and will show why they are not Christian, not least of the reasons is that they denigrate and marginalize the Bible to make their other scriptures more important while at the same time claiming the Bible as one of their scriptures, so long as it is translated correctly, in an effort to add credibility to the church. The "translated correctly" is thrown in there so they can claim they believe the Bible while still having an out when it doesn't agree with some of their doctrine. The official view of the Church on the Bible, despite the fact that they use the KJV of the Bible, is that the Bible has become corrupted and parts of it were corrected by Joseph Smith in his "Inspired translation" of the BIble. Translation is not even remotely the correct word for what Smith did, however, because if you take a work that has already been translated into English and use the English translation of that work as your source and then write something different than it isn't translating but a rewriting or a reimagining of the source material to suit your own purposes. There are many, many things in the LDS Church that when said to someone inside the church verses someone outside the church it means a completely different thing, and there are also things where the membership and the Church officially has different answers, and two of the most important of those are what the Church members tell people they believe about the Bible and other churches and what the LDS Church officially believes about the issues based on their other canonized scriptures. I will start with what the Church thinks of other churches. If asked what the Church thinks of other religions, especially Christian religions, the vast majority of leaders and rank and file members of the Church would reply that they believe that all churches have truth but the LDS Church has all the truth. From there the would probably explain that when Jesus left the earth he had organized his church in the manner he wanted it and after a while all of the apostles were killed and the church fell into apostasy, and like people grabbing shards of a broken mirror, everyone took aspects of the true church and organized their own church. He or she would then explain how the church was restored with "the power of God" though Joseph Smith and that makes it the only church that has all the truth. "Bring us your truth," they say, " and we will show you the rest of the truth." Each and every member of the church, while thinking they have a monopoly on truth, will say that they respect other churches, but their doctrines and scriptures say otherwise. In one of the LDS Churches canonized books, the Doctrine and Covenants (hereafter referred to as D&C) chapter 18 and verse 20, D&C 18:20 it gives a revelation to the members of the church about their interaction with other churches when they are proselytizing and says, "Contend with no church, save it be the church of the devil." Which churches does LDS doctrine consider to be the church or churches of the devil? I am glad you asked, and I can readily answer that with the LDS Church's foundational book, The Book of Mormon. In the Book of Mormon, shortly after leaving Jerusalem, one of the prophets of the book has a vision from God in which he is shown the Bible and other churches and I will quote the relevant sections. 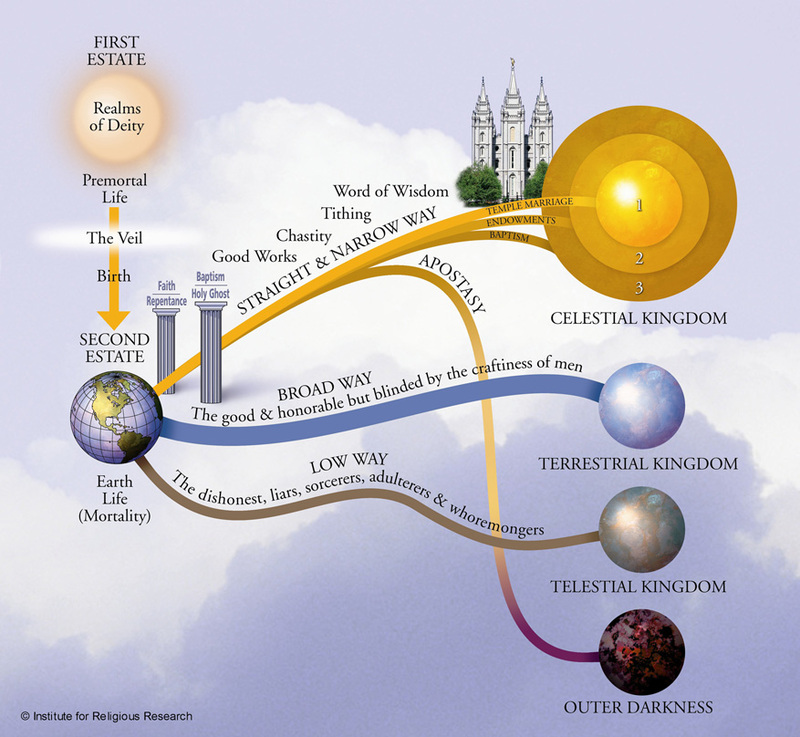 The passages in question come from the book of 1 Nephi in chapter 13. And it came to pass that the angel spake unto me, saying: Look! And I looked and beheld many nations and kingdoms. And the angel said unto me: What beholdest thou? And I said: I behold many nations and kingdoms. And he said unto me: These are the nations and kingdoms of the Gentiles. And it came to pass that I beheld this great and abominably church; and I saw the devil that he was the founder of it. "And also for the praise of the world do they destroy the saints of God, and bring them down into captivity. I will take a pause from 1 Nephi 13 here to discuss the "great and abominable" church he spoke of and the Church's view of other religions and will return to 1 Nephi when I talk about the Bible. If a member of the LDS Church were asked by a baptist, Pentecostal, Methodist, Lutheran or other faith if they or their church was the church of the devil they would say that they did not think so and Nephi wasn't speaking of any specific church, just those who persecute the true church. "And he [he being the angel who was visiting Nephi] said unto me: Behold there are save two churches only; the one is the church of the Lamb of God, and the bother is the church of the devil; wherefore, whoso belongeth not to the church of the Lamb of God belongeth to that great church, which is the mother of abominations; and she is the whore of all the earth." If we go to the next chapter in 1 Nephi we learn which church the church of the devil is. 1 Nephi 14:10 says "And he [he being the angel who was visiting Nephi] said unto me: Behold there are save two churches only; the one is the church of the Lamb of God, and the bother is the church of the devil; wherefore, whoso belongeth not to the church of the Lamb of God belongeth to that great church, which is the mother of abominations; and she is the whore of all the earth." From the above passage we learn that the official view is that there are only two churches, the church of the Lamb of God and the church of the devil. Now let us discover whether or not any other church outside of the LDS Church would be considered by them to be part of the church of the Lamb of God. In D&C 1:30 it tells us how many churches are true, "And also those to whom these commandments were given, might have power to lay the foundation of this church, and to bring it forth out of obscurity and out of darkness, the only true and living church upon the face of the whole earth, with which I, the Lord, am well pleased, speaking unto the church collectively and not individually-"
So from the above passage we learn that the official view of the LDS Church is that they are the only church on the face of the earth that is true, and based on how heavily the LDS Church proselytizes members of other faiths it is evident that none of them are considered to be part of their church, and Nephi says that there are only two churches, the church of the Lamb of God, or the LDS Church, and the church of the devil which is the great and abominable church and the whore of all the earth. Basically D&C 118:20 is saying to contend against all churches that are not the LDS Church. We will now return to the narrative in 1 Nephi. For anyone not familiar with LDS history or doctrine, the church collectively believes that the people from the Book of Mormon fled from the holy land and God brought them to the Americas and the people split into two groups, the Nephites who were holy and followed the commandments of God, and the Lamenaites who were wicked and were cursed with a skin of darkness to distinguish them from the righteous Nephites. The Church believe that the Lamenites are the "principle ancestors of the American Indians" and the above passage was speaking of the Europeans being separated by the ocean from the native Americans. The passage continues with an allusion to the discovery of America by Christopher Columbus and the Europeans coming to America, causing problems for the natives and than the revolutionary war. The line about them being white, and exceedingly fair and beautiful, like unto my people before they were slain," refers to the Nephites being white and eventually being destroyed by dark Lamanites. "And I beheld that their mother Gentiles were gathered together upon the waters, and upon the land also, to battle against them. The plates of brass referred to are some that earlier in the story Nephi acquired by killing a man named Laban and stealing them from him and they were, according to the story, the writings of the holy prophets and instead of being written on golden pages like the Book of Mormon, they were written on brass pages. What was written on the brass pages was later abridged and written on the gold plates by Moroni. Now that the brass plates have some context I will return to the narrative. And after these plain and precious things were taken away it goeth forth unto all the nations of the Gentiles; and after it goeth forth unto all the nations of the Gentiles, yea, even across the many waters which thou hast seen with the Gentiles which have gone forth out of captivity, thou seest—because of the many plain and precious things which have been taken out of the book, which were plain unto the understanding of the children of men, according to the plainness which is in the Lamb of God—because of these things which are taken away out of the gospel of the Lamb, an exceedingly great many do stumble, yea, insomuch that Satan hath great power over them. So we see that the official doctrine of the LDS Church is that the Bible, the way we have it today, is corrupted and is missing many of the plain and precious truths that are necessary for salvation. This is why their official doctrine says that they believe the Bible, so long as it is translated correctly (according to them) which means that the only part of the Bible that they can say with 100% certainty that they believe is the part that Jospeh Smith "translated." One of the biggest claims the LDS Church makes against any other church being correct is that the Bible was corrupted. With a little investigation, however, it is abundantly clear that the Bible was not tampered with, that nothing was taken out and that there were no doctrines or events added after the fact. There isn't enough time to get into it in this episode in depth, but there is a great book called Can We Still Believe the Bible by Craig L. Bloomberg (2) that I will list with an amazon link and ASIN number in the notes at the end, but if you have any doubts about the Bible or would just like to know more about it this is a phenomenal book and goes into great depth about how we got the Bible, its translation process, how it was copied and how we can know with certainty that it is as it was originally written. Back to Nephi and his view of the Bible, churches, America and the natives of the American continent, Jumping back in in verse 30. Nevertheless, thou beholdest that the Gentiles who have gone forth out of captivity, and have been lifted up by the power of God above all other nations, upon the face of the land which is choice above all other lands, which is the land that the Lord God hath covenanted with thy father that his seed should have for the land of their inheritance; wherefore, thou seest that the Lord God will not suffer that the Gentiles will utterly destroy the mixture of thy seed, which are among thy brethren. While it is not talked about much the LDS Church is very much an America first church that considers America, and by extension Americans, to be more blessed and chosen than others. While I am grateful to have been born and raised in America, Christ did not die for Americans, He died for the world. Back to the verses. Neither will he suffer that the Gentiles shall destroy the seed of thy brethren. "Neither will the Lord God suffer that the Gentiles shall forever remain in that awful state of blindness, which thou beholdest they are in, because of the plain and most precious parts of the gospel of the Lamb which have been kept back by that abominable church, whose formation thou hast seen. And it came to pass that the angel of the Lord spake unto me, saying: Behold, saith the Lamb of God, after I have visited the remnant of the house of Israel—and this remnant of whom I speak is the seed of thy father—wherefore, after I have visited them in judgment, and smitten them by the hand of the Gentiles, and after the Gentiles do stumble exceedingly, because of the most plain and precious parts of the gospel of the Lamb which have been kept back by that abominable church, which is the mother of harlots, saith the Lamb—I will be merciful unto the Gentiles in that day, insomuch that I will bring forth unto them, in mine own power, much of my gospel, which shall be plain and precious, saith the Lamb. For, behold, saith the Lamb: I will manifest myself unto thy seed, that they shall write many things which I shall minister unto them, which shall be plain and precious; and after thy seed shall be destroyed, and dwindle in unbelief, and also the seed of thy brethren, behold, these things shall be hid up, to come forth unto the Gentiles, by the gift and power of the Lamb. And in them shall be written my gospel, saith the Lamb, and my rock and my salvation. And blessed are they who shall seek to bring forth my Zion at that day, for they shall have the gift and the power of the Holy Ghost; and if they endure unto the end they shall be flitted up at the last day, and shall be saved in the everlasting kingdom of the Lamb; and whoso shall publish peace, yea, tidings of great joy, how beautiful upon the mountains shall they be. "And it came to pass that I beheld the remnant of the seed of my brethren, and also the book of the Lamb of God, which had proceeded forth from the mouth of the Jew, that it came forth from the Gentiles unto the remnant of the seed of my brethren. And after it had come forth unto them I beheld another books, which came forth by the power of the Lamb, from the Gentiles unto them, unto the convincing of the Gentiles and the remnant of the seed of my brethren, and also the Jews who were scattered upon all the face of the earth, that the records of the prophets and of the twelve apostles of the Lamb are true. And the angel spake unto me, saying: These alast records, which thou hast seen among the Gentiles, shall establish the truth of the first, which are of the twelve apostles of the Lamb, and shall make known the plain and precious things which have been taken away from them; and shall make known to all kindreds, tongues, and people, that the Lamb of God is the Son of the Eternal Father, and the savior of the world; and that all men must come unto him, or they cannot be saved. And they must come according to the words which shall be established by the mouth of the Lamb; and the words of the Lamb shall be made known in the records of thy seed, as well as in the records of the twelve apostles of the Lamb; wherefore they both shall be established in bone; for there is cone God and one Shepherd over all the earth. And the time cometh that he shall manifest himself unto all nations, both unto the Jews and also unto the Gentiles; and after he has manifested himself unto the Jews and also unto the Gentiles, then he shall manifest himself unto the Gentiles and also unto the Jews, and the blast shall be first, and the first shall be last. The last part of that passage was mostly a self-prophecy about Joseph Smith and the coming of the Book of Mormon, but anytime any member of the LDS Church says that they, and/or the Church, thinks that all churches are good but they are the only one with all the truth, have them read 1 Nephi chapters 13 and 14. The way the culture is in the LDS Church, if a member leaves the church but does not have their records removed and does not attend church anywhere else they are considered to be an inactive member and have a chance of salvation still, but if a member leaves the Church and aligns his or herself with another church, especially if they have his or her records removed, they are considered to be an apostate and are destined for outer darkness. In LDS theology, most everyone, including Adolf Hitler, goes to some sort of glory after this life and that the only ones who go to what traditional Christianity would consider hell are apostate Mormons, the devil and his angels, of course, they call it outer darkness and not hell. LDS theology is immensely interesting, convoluted and blasphemous, and I plan on exploring it in great depth in later episodes, but for now, for the sake of time, we have to move on. Basically, I brought up how the church looks at members who go to other churches to illustrate how the church feels about other churches. Whenever a person is visiting non-member family member and attend their church with them and the other LDS people find out they act as if they had attended a devil worshiping ritual, but considering the fact that they officially think other churches are the church of the devil it makes sense. You would be hard pressed, however, to get any active LDS person to ever admit that they think of other churches as the churches of the devil. When I was serving a Mormon mission to Hawaii, and no it wasn't a vacation, I worked hard and never got to even step foot on the beach, another missionary was telling people that their churches were the great whore of all the earth and the church of the devil. I, of course, scolded him and said that he should not say that because it would drive people off instead of making them want to learn about the church. When he protested I asked if anyone had ever told him he was part of a cult and when he answered in the affirmative I asked him if he thought, "Wow, I have never considered that," and was immediately compelled to leave the church. The mission president reprimanded him for telling people what he did and once he got off the phone with the president he threatened to beat me to death and throw my body in the ocean and later said he hoped I got hit by a car and died a painful and gruesome death. That same Elder (male missionaries are called elder because that is their rank in the LDS priesthood when they go on a mission) on many other occasions told me that thought I was crazy because I had read the Book of Mormon and other scriptures so much, at that point, less than six months into my mission, I had read the Book of Mormon 37 times. I always found it curious that LDS people loudly and proudly say they are the only ones to serve Jesus Christ, yet most of the members will not talk about Jesus Christ of what they hold to be His doctrine outside of church. You will often see Mormon bumper stickers on cars that proclaim them members of the church, remind people to follow the prophet, etc. but they will not put the Christian fish on their cars and they absolutely loath the term "born again," even though Jesus said in the Bible that all must be born again. Of course, that may be part of the Bible that many in the church consider to be corrupted. What President Hinkley was saying there is that the LDS Church does not believe in the same Christ that mainstream Christianity does because, in his view and the view of the Church, the Christ that Christianity believes in is not the true Christ but a version created by man. We are definitely in agreement that we don't believe in the same Christ, but where we differ is whether the LDS Church's Christ created by Joseph Smith is the true Christ or whether the Christ of the Bible is the true Christ. From what I know of the Bible and what I know of the LDS Church, which is a tremendous amount in each case, I gladly trust my salvation to the Jesus Christ of the Bible, the Christ who was always God and not the Jesus of the Mormons who was created by a god who used to be a man. The god of the LDS Church can't be the eternal God because their god has a beginning and by very definition can't be eternal. I will unpack all of these in later episodes, but what I say to any LDS person who claims we believe in and serve the same God I say, "If there was ever a time when your god was not God than we don't believe in the same God. If your god was ever a man or if any person can attain to where your god is now than we don't believe in the same God. If your god is three gods and not one God than we don't believe in the same God. If the Jesus you believe in and Lucifer are brothers than we don't believe in the same God. If the father has a physical body of flesh and bones than we don't believe in the same God. If your god was ever less than he is now or if he will ever be greater than he is now than we don't believe in the same God. If your god can or will only forgive you your sins after you have done specific works and ordinances and not by grace alone than we don't believe in the same God. If any of what the D&C or Pearl of a Great Price says about your god is an accurate assessment of your god than we don't believe in the same God. If Joseph Smith has any say in your salvation or the salvation of anyone else than we don't believe in the same God. If your Jesus paid for your sins anyplace other than the cross we don't believe in the same God. If there are any gods besides the one God than we don't believe in the same God." There are a lot of reasons why Mormons, or Latter Day Saints as they like to call themselves, are not Christian, despite them firmly thinking that they are, some of which I listed above and some of them I haven't, and I plan on exploring those issues in detail. Initially I thought this was going to be a stand alone episode, but the claim that the LDS Church is not a Christian church is such a weighty topic that I will have to make it a series.